Choose an area of specialization within the program, or select a specific track or focus area in conjunction with another department. Students may pursue accelerated dual-degree programs with the School of Advanced International Studies (SAIS), Pompeu Fabra, or Sciences Po Paris. Students gain a variety of perspectives through which to analyze international events, drawing on many different fields. Study abroad with SAIS Bologna, Sciences Po Paris, or Waseda University. The Program in International Studies is an interdisciplinary major drawing on the diverse strengths of Johns Hopkins University in the fields of political science, history, economics, anthropology, sociology, and languages. The program offers a variety of options that extend beyond the major, including several five-year BA/MA programs, and a wide range of study abroad opportunities around the world. 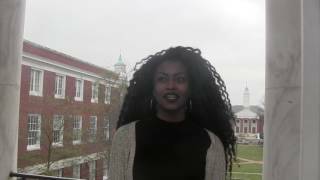 Student Michelle Oguine explains why she chose to major in International Studies. Join the International Studies Program as we say farewell to the spring semester with ice cream and popsicles. All are welcome, especially newly declared students to the International Studies major. Email internationalstudies@jhu.edu with the word “list” in the subject line. Students, indicate your class year and intended majors and minors (if applicable) in the body of the message.